Contributions should be in English, and be word-processed or typed using 1.5 spacing, and printed on one side of A4 or 8.5 x 11 paper. They should be ca 5000 words in length, although shorter and longer pieces will also be considered. Articles should ideally be produced in electronic form (e.g. as a Word.doc, or .rtf format). Please send your article as an email attachment to journal@williammorrissociety.org.uk, or on a memory card or CD, marked for the attention of the Editor, JWMS, to The William Morris Society, Kelmscott House, 26 Upper Mall, Hammersmith, London, W6 9TA, United Kingdom. Contributions in hard copy only are also accepted, and should be sent to the same address. In formatting your article, please follow JWMS house style by consulting a recent issue of the Journal. Back issues are available from the William Morris Society at the above address, or online atwww.morrissociety.org/publications/journal.html. Articles which do not follow this house style may be returned to authors for re-editing. Notes. These should be numbered consecutively and should appear at the end of your article. Please avoid using the automatic note-numbering facilities available with some word-processing packages, as these slow down final editing considerably. Instead, please cite all references in your text by superscript (e.g. 1, 2 ), and list them at the end of the article, in normal script, under the heading NOTES. Quotations. Please refer where possible to primary rather than to secondary sources, and give all direct quotations in single quotation marks. Quotes within quotes should be identified using double quotation marks. Sources. When citing books, please give the following details: (i) author/editor, (ii) title of book (italicised), (iii) place of publication, (iv) publisher, (v) date of publication (and original date of publication if different from that of the edition which you are using), (vi) volume, if appropriate, (vii) page number(s) of quote or information cited; e.g. May Morris, ed, The Collected Works of William Morris. London: Longmans, Green and Co., 1910-15, XIV, pp. 212-13. If no specific citation, please give number of pages in book (e.g. 364 pp.). When citing articles from, or chapters in, books, please give: (i) author, (ii) ‘title of article’ (in single quotation marks), (iii) in (iv) name(s) of editor(s), (v) title of book (italicised), (vi) place of publication, (vii) publisher, (viii) date of publication, (ix) page number (s) of quote or citation; e.g. Jan Marsh, ‘Concerning love: News from Nowhere and gender’, in Stephen Coleman & Patrick O’Sullivan, eds, William Morris and News from Nowhere. A Vision for Our Time. Hartland, UK: Green Books, 1990, p. 116. If no specific citation, please give number of pages in article/chapter (e.g. pp. 107-125). When citing articles from journals and other periodicals, please give: (i) author, (ii) ‘title of article’(in single quotation marks), (iii) title of journal (italicised), (iv) volume/number, (v) date, (vi) page number(s) of quote or citation; e.g. Margaret D. Stetz, ‘The Changing Politics of Fantasy: From Morris and Schreiner to the Present’, Journal of Pre-Raphaelite Studies 10, Spring 2001, p. 94. If no specific citation, please give number of pages in article (pp. 90-98). When citing articles or other material from electronic sources, please give (i) author (if applicable), (ii) ‘title of article/item’ in single quotation marks (if applicable), (iii) location of passage (in parentheses), (iv) title of complete work/resource/website, (v) publication details (volume, issue, date), (vi) full electronic address (i.e. Universal Resource Locator – URL), (vi) [date last accessed] (in square brackets); e.g. ‘Chapter 2, “ Mediaeval Society’, in William Morris & E. Belfort Bax, Socialism From The Root Up, or Socialism Its Growth and Outcome, 1886-1888, as published in Commonweal, Volume 2, Number 19, 22 May 1886, p. 61, quotation from paragraph three. http://www.marxists.org/archive/morris/works/1886/sru/ch2.htm [last accessed 28 March 2008]. Many electronic sources, especially databases, do not possess editors or authors, however, and may need to be cited in more general terms, e.g. Census Returns of England and Wales, 1891; http://www.uk1891census.com [last accessed 28 March 2008}. The most important information is the URL, which allows the reader to access the material you wish to quote. Many of these are ‘case sensitive’, so please beware to quote them correctly, and to check that they work. Numbers in the text should only be used for NOTES, dates, line numbers of poems, exact large numbers, sums of money, and data. For dates use day, month, year (e.g. 6 July 1855); for decades use numbers (e.g. 1890s); for centuries spell in full (e.g. nineteenth); for figures up to and including one hundred, and for round numbers thereafter, use words (e.g. fifty, forty-five, two hundred and fifty, three thousand, two million). For exact large numbers, upwards of one hundred, use numerical values (e.g. 464; 5,280; 95,600). For sums of money, use numbers (e.g. £2,500). Illustrations. Please do not embed your illustrations in your text, but include them separately with your article, as .JPEG files or some other accessible electronic format, or as hard copy. Please note that articles proposing the use of a large number of illustrations, or citing famous and well-known works only, may be printed without such figures, or with their numbers reduced. If using digital images, please ensure that they are of sufficient resolution to reproduce well, and send them to the editor by email (editor@morrissociety.org), or on a CD, with one hard copy, to the William Morris Society at the above address. Copyright. Please remember also to obtain permission from the copyright owner/owning institution (s) (e.g. the Tate Gallery, William Morris Gallery, etc.) to reproduce the image(s) you wish to include. Please note that it is the author’s responsibility to secure permissions to reproduce an image. Copies of permissions to reproduce copyright illustrations will be requested once articles have been accepted for publication. Permissions relating to Morris’s own works should be sought from: The General Secretary, Society of Antiquaries of London, Burlington House, Piccadilly, London, W1J 0BE, United Kingdom or by email at admin@sal.org.uk. Biographical information. At the end of your article please include a short biographical note of not more than fifty words. 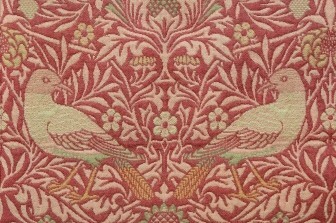 Please note that the views of individual contributors are not to be taken as those of The William Morris Society.